Ona Mae Fath, age 84, longtime resident of Tonkawa, OK passed away Wednesday, February 20, 2019 in Ponca City, four days after her husband Roy. A funeral ceremony to celebrate Ona Mae's life will be held at 2:00 pm, Thursday, February 21, 2019 at the First United Methodist Church in Tonkawa with Pastor Robert Harris officiating. Ona Mae's grandsons will serve as casket bearers. Following the ceremony, Ona Mae will be laid to rest next to her husband Bobby Fruits at the Tonkawa I.O.O.F Cemetery. Arrangements are under the direction of Trout Funeral Home & Cremation Service of Tonkawa. Ona was born on November 9, 1934 to Robert Frances Pursifull and Esther Barbara Zimmerman Pursifull in Tonkawa, OK. She was raised in Tonkawa and then, during junior high, moved to Elk City, OK where she graduated high school in 1953. Shortly after graduation, Ona Mae returned to Tonkawa by way of an exciting family story. She then married Bobby Fruits in July of 1953 in Tonkawa at the same church where her life is being celebrated. They were married for 36 years before his passing in 1987. Later in life, she reconnected with her childhood boyfriend Roy Fath. They were married on Dec. 14, 1997 in Tonkawa, having celebrated 21 years of marriage before his death late last week. Through the years, Ona Mae helped Bobby around the farm as a faithful house wife. Later, she worked for the banks in Tonkawa and helped some in the community with their taxes. Ona Mae thoroughly loved her family enjoyed sharing her cooking and time with them. Her pies were well known around town with lunch and munch selling slices for some years. As well, she loved working outside in the yard, singing in the choir at church and traveling around the country. 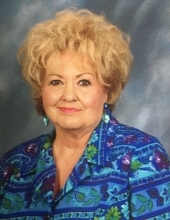 She has been active in the Tonkawa Historical Society, the 20th Century Club,as well as life long member of the Tonkawa First United Methodist Church. Survivors include her adored children: Debbie Flanery and husband Frank of Tonkawa, Gary Fruits and wife Robin of Skiatook, OK, David Fruits and wife Melissa of Tonkawa, siblings: Charlie Pursifull and wife Barbara of Edmond, OK, Victor Pursifull of Wichita, KS, cherished grandchildren: Michael Flanery and wife Charlene of Tonkawa, Matthew Flanery and wife Jennifer of Woodward, OK, Scott Flanery and wife Kacey of Ponca City, Abby Knight and husband Emory of Perkins, OK, Kevin Fruits of Perkins, OK, Brett Fruits and wife Tiffany of Blackwell, OK, Kelsey Fruits of Tonkawa and Zachary Fruits of Tonkawa as well as seven great grandchildren. Ona Mae was preceded in death by her parents, husbands Bobby Fruits and Roy Fath, in addition to her brothers Wilbur Pursifull and Frances LeRoy Pursifull. To send flowers or a remembrance gift to the family of Ona Mae Fath, please visit our Tribute Store. "Email Address" would like to share the life celebration of Ona Mae Fath. Click on the "link" to go to share a favorite memory or leave a condolence message for the family.